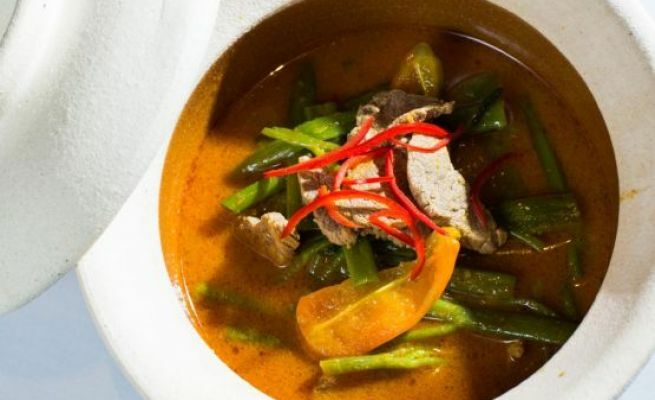 With a wide selection of champagnes, wines, spirits and cocktails, Palate Angkor Restaurant & Bar is a popular place for breakfast, private A la carte lunch and diner, parties, events or social gatherings in a cosy setting and atmosphere. 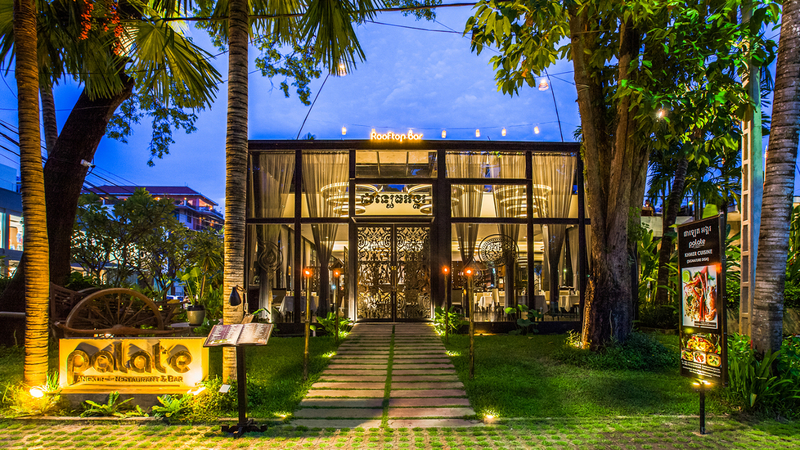 With a capacity of up to 120 persons in the indoor main restaurant and up to 150 persons at the rooftop bar, the Palate Angkor is the perfect location for events such as wedding receptions, birthdays, cocktail parties, company parties and many others. Palate Angkor Restaurant & Bar has recently been refurbished. With a fresh and new look it is the perfect venue for a relaxing breakfast lunch or diner. 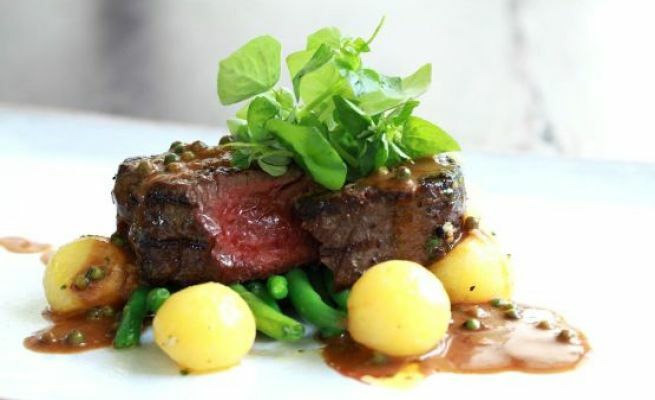 After enjoying sunset and cocktails at the roof top bar enjoy diner, watch the stars and enjoy a meal of high quality. Or dine in the ground floor restaurant with a cool indoor and charming atmosphere that retains the history and charm of the 1950’s building style. 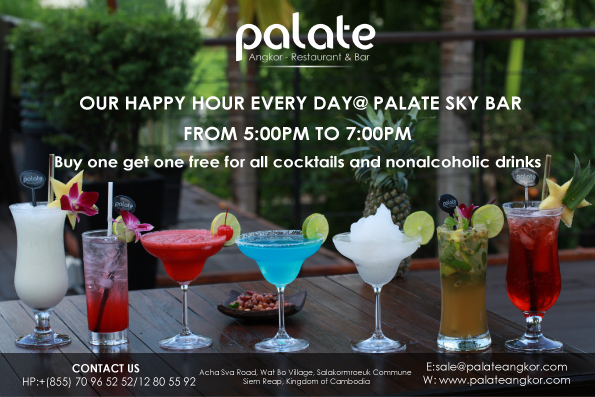 Dine with your beloved ones, family and friends at our Palate's Roof Top Bar. Every Tuesday and Thursday enjoy with our live music a great selection of food and drinks. International Women’s Day is celebrated on March 8 worldwide! 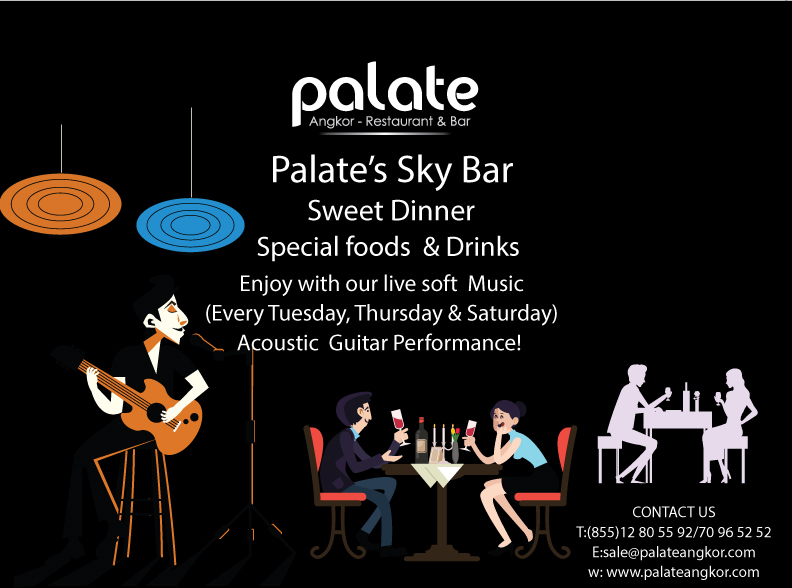 The Palate Angkor Restaurant and Roof Top Bar (Live music) is the place to celebrate with your beloved one. Enjoy our special choices of food and drinks. 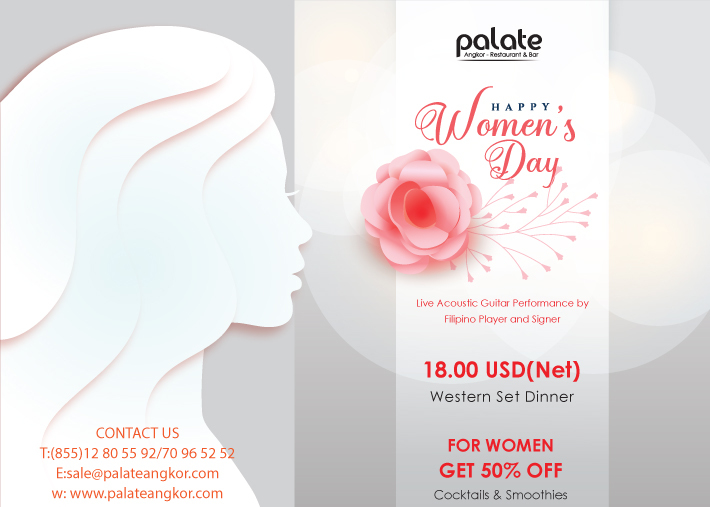 Special 50% off for women on cocktails and non alcoholic beverages. 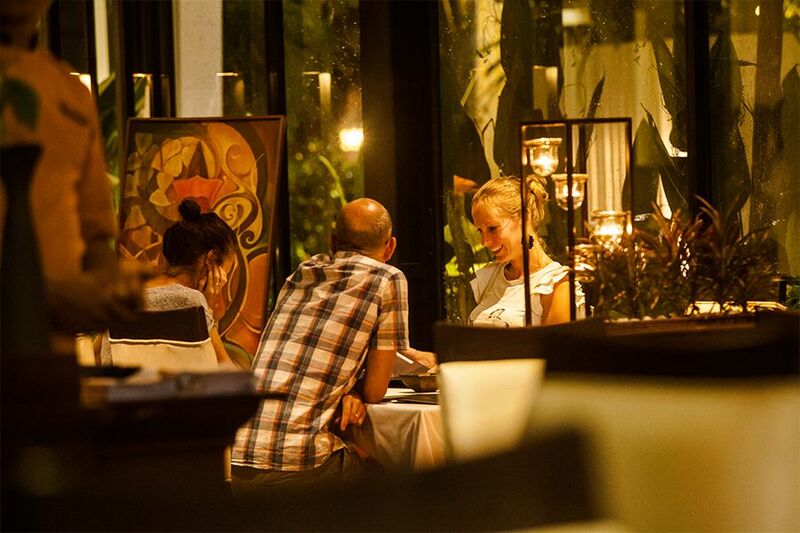 Surprise your beloved one with a special private evening at the main restaurant or at the Roof Top Bar. Table decorated in private setting with candles and flowers will make your venue a most romantic one. 6:30 to 7:00pm – Cocktail Reception at the Pool Bar with pre-diner appetizers, a special gift and live music entertainment. 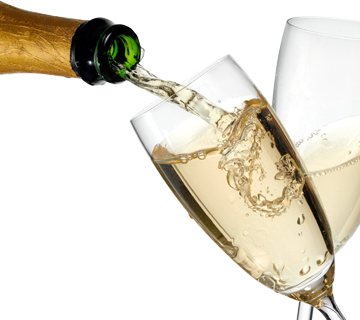 7:15 to 8.30pm – Sparkling wine opening ceremony served at the table at the Roof Top Bar. Cocktail reception from 06:30 to 07:15 pm at the Pool Bar with appetizers, gift and music entertainment. Live music, Khmer traditional dancing, lucky draw, countdown with sparkling wine and flying balloons. 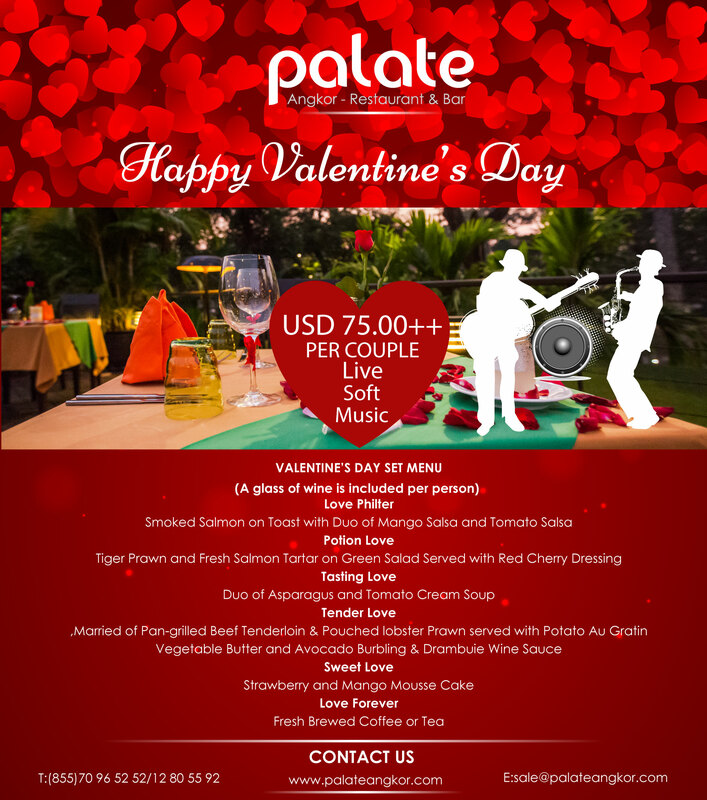 Spend Valentine's evening at the Palate's Rooftop Bar with your beloved one. Buy one get one free for all cocktails and nonalcoholic drinks!